February has gone so quickly, but I've had so much fun! Below are some of the things I loved last month. This has been my favourite face lotion from last month, which I applied every night and morning. It left my skin feeling fresh and smooth. My absolute favourite blusher! I love the coral colour, and the shimmery highlighting property. The pigmentation is amazing and hopefully the product should last me ages. This necklace is very special to me as it was a gift from my auntie, uncle, nan and grandad for my 16th birthday. The black gemstone is so simplistic and beautiful, and I love the dainty chain. I have been wearing this necklace to every time I go out. I love this pastel pink coat from Forever 21, and I have worn it non-stop! In the picture above, I am wearing it at London Fashion Weekend, and I received lots of compliments, which I was very pleased about. One thing I would say about the coat is it's not very warm, so you need to layer up when wearing it, although it will be perfect now as the weather is getting warmer. I re-found my love for the series Modern Family last month. It is an hilarious comedy which I absolutely love. My TV is always full with recorded episodes that I watch over and over again. My favourite characters are Cam, Mitchel and Gloria, but I love them all! I listened to lots of music last month, especially after the Brit Awards! I have been listening to more Ed Sheeran and Royal Blood. Although, my favourite artist this month has been Kid Ink with my favourite songs being Body Language and Hotel. This perfume was my absolute favourite last month. The smell is divine and it is so long lasting. I love the look of the bottle too with all it's black glitter. 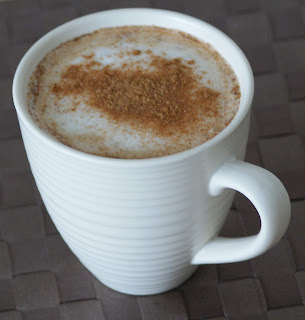 In the February cold evenings, a mug of chai latte is just what I needed. The sweet, aromatic smells fill the house with beautiful aromas and the taste is so delicious and warming. I love Elle Magazine so much! The stories and photos were amazing last month, with such beautiful fashion pages. Elle is not only my favourite magazine last month, but one of my all time favourite magazines.